We have developed a special expertise in the lyophilisation of proteins, peptides and small molecules. 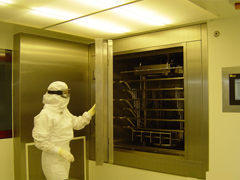 The Klee freeze-dryer installed in grade A environment is used for both clinical and commercial applications. 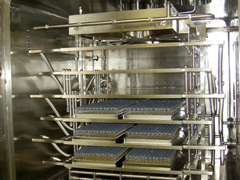 Its capacity is 3.5 m2 and it is equipped with an automatic stoppering system, cleaning in place (CIP) and sterilization in place (SIP) systems. The capacity of the condenser is 45kg.